1 of 3 Remove skin from salmon fillet: With a sharp knife, cut a small corner of the skin away from the flesh. Then, gently pull and slice off remaining skin, trying to keep as much flesh intact to make the burgers. Discard skin; coarsely chop salmon. 2 of 3 Heat gas grill to medium-high or coals in charcoal grill to medium hot. Transfer salmon to a food processor, along with scallions, 1 tablespoon of the dill, the lemon zest, panko, salt and pepper. Pulse until salmon is the consistency of ground beef but still has some shape. Do not overprocess. 3 of 3 Form mixture into 4 patties, each about 3 1/2 inches in diameter. Coat patties with nonstick cooking spray. Grill patties 5 minutes. Flip over and continue to grill another 5 minutes. Meanwhile, stir remaining tablespoon of the dill into tartar sauce. Divide lettuce evenly among buns. 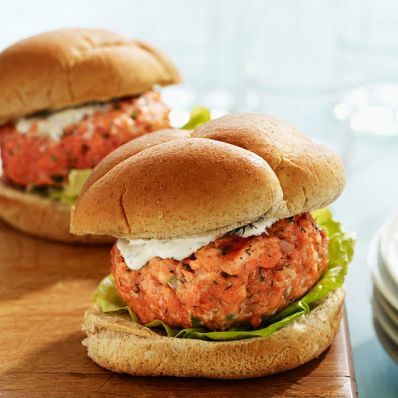 Top each with a burger patty and 1 tablespoon tartar sauce. Per Serving: 720 mg sodium, 39 g pro., 485 kcal cal., 3 g sat. fat, 6 g fiber, 18 g Fat, total, 42 g carb., 95 mg chol.